Bacton is not the most picturesque of Suffolk's villages. With its thoroughly non-identical Siamese twin, Cotton, it straddles the B1113 Stowmarket to Rickinghall road; you turn west, and the railway bridge heralds a sense of the urban. The presence of a middle school in the village means that this can be a very busy place at certain times of the day. The setting of St Mary is also a fairly urban one; houses and another school encroach, but it rides it all well, for this is a large, externally grand church. The view is finest from the north-east. One symptom of the urban spirit is, I'm afraid, that I have always found St Mary locked (although, of course, most Ipswich churches are left open). This great late medieval church is not as well known as some. Externally, the tower is not its best feature, despite the surviving 14th Century bell windows. Mortlock thought the strangely rounded 'Norman' west door was actually the work of William Butterfield, the restoring architect in the 1860s. Certainly, there is no other Norman evidence here. The finest feature of the exterior is the late 15th Century clerestory, a match for that at Walsham le Willows, a few miles off. It has sacred monograms between each window, picked out in fluchwork, including the Holy Trinity and St Catherine, and there is a dedicatory inscription asking you to pray for the souls of Robert Goche and his wife (on the north side) and Sir James Hobart and his family (on the south). When I visit a grand church like this, I often anticipate disappointment before stepping inside. Will I find the great medieval building that this once was, or the mundane Victorian restoration which rescued it from decay? In a way, you get both here. Your hopes are indeed fulfilled, for here we have one of Suffolk's best double hammerbeam roofs. It is so good, that work in this style is often referred to as 'a Bacton roof' - there's another across the way at Cotton, almost certainly the work of the same craftsmen. Another exciting medieval survival is the substantial remains of a doom painting above the chancel arch. The central area is destroyed, but we see below the various activities that roll into action as a soul approaches judgement. The dead rise from their graves, and St Peter is beautifully clear as he stands at the narrow gate of Heaven welcoming in the new Saints. The disappointment of the 19th century restoration is a double one, for it is the work of that great ground-breaker, William Butterfield, who produced some excellent work in the county at Sudbury St Peter and Lawshall, not to mention Ipswich St Mary at Stoke. This is certainly not bad. But it doesn't thrill, or even raise the spirits. It is enlivened by later Morris & Co glass in the east window, which even in its 1920s incarnation stands out as superior here. It forms a war memorial, and reuses cartoons from much earlier in the workshop's days. The best are the four evangelists, by Edward Burne-Jones, first used at Paisley parish church in 1876. They sway elegantly, their evangelistic symbols passing over their shoulders. The angels in the row above are also by Burne Jones, but the other figures are by John Henry Dearle, the workshop's chief designer after the deaths of Morris and Burne-Jones. 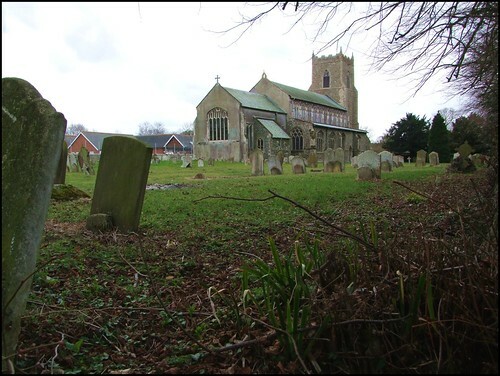 Coming back to Bacton in the spring of 2009 after ten years away, I was pleased to find I liked the church a great deal more than I'd remembered. It is ful of interest, with intriguing little details to ponder, and on this bright day was full of light. The elegant screen seems rather awkwardly placed, and this is because it originally came from the south aisle, where it formed a parclose to a chapel. To the north of it is a painted inscription behind the pulpit to Thomas and Dorothy Smythe, who died in 1702 and 1728. Another husband and wife are commemorated down at the west end of the aisle, by almost identical cartouche memorials facing each other across from the south and north arcades. George and Jane Pretyman died in the 1730s, and you might think that their memorials were made at the same time if it were not for slight differences that suggest one was copied from the other, probably by a different mason. The winged skulls at the bottom are particularly fiendish. A number of the benches are medieval, and some of the bench ends are medieval too, I think. One shows a monk in a pulpit with an eagle, which may be intended as St John but might just as easily be intended to represent the reading of the Gospel. The 19th century dog and lion nearby are also very good. All in all, this is a fine church. From Bacton, you are spoiled for choice for others. Within a few miles are Cotton, Wyverstone, Westhorpe, Mendlesham, Gislingham and Gipping. A curiosity about this area is what a Godless lot they seem to have been in the middle of the 19th Century. At the time of the 1851 Census of Religious Worship, most Anglican churches could reasonably expect an attendance of about a third of the parish population on a Sunday, and in some parts of Suffolk this rose to almost a half. In this area to the north of Stowmarket, which was always strong non-conformist territory, Anglican congregations were rarely more than a tenth of the population, with Bacton one of the worst examples - out of the 901 people living in the parish at the time of the census, just 25 attended St Mary on the Sunday morning. And it doesn't seem that the missing souls were going anywhere else - 260 attended Cotton Methodist Church in the afternoon, but that was in the adjoining parish where another 571 people lived. Bacton's own Wesleyan and Primitive Methodist churches managed about 60 each, but unless the people were going down the road to the Baptists at Stowmarket, it looks as if they simply stayed at home.